Cable supports screen sizes up to 72 inches. 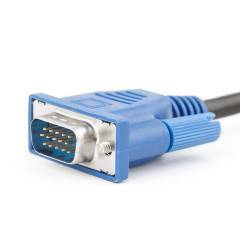 The male to male VGA cable provides superior signal transmission. Shielded with premium quality nickel from inside the cable, it offers distortion-free connectivity too. The adapter cable is resistant to rust and abrasion and offers hassle-free functionality for extended period of time. Electrobot 1.5m 15 Pin Male to Male VGA Cable, PC-GDJR-0050 (Pack of 3) is a premium quality Connectors & Jumpers from Generic. Moglix is a well-known ecommerce platform for qualitative range of Connectors & Jumpers. All Electrobot 1.5m 15 Pin Male to Male VGA Cable, PC-GDJR-0050 (Pack of 3) are manufactured by using quality assured material and advanced techniques, which make them up to the standard in this highly challenging field. The materials utilized to manufacture Electrobot 1.5m 15 Pin Male to Male VGA Cable, PC-GDJR-0050 (Pack of 3), are sourced from the most reliable and official Connectors & Jumpers vendors, chosen after performing detailed market surveys. Thus, Generic products are widely acknowledged in the market for their high quality. We are dedicatedly involved in providing an excellent quality array of Generic Connectors & Jumpers.